Short answer, yes. But I will also give you a long answer! I will do that for many reasons, one is that depending on your goals, you might consider other education outlets. Another is that nothing is perfect, no school is perfect, so I can let you know what you will get for your time and money and what you will not. Here are, in my experience, the pros and cons of going for a classical atelier education. The drawing and painting processes are outlined and precise, you follow the steps you will end up with a convincing painting. Period. The Atelier environment is a bubble. A lot of people end up holding classical art and it’s practices as the epitome of art making. Which is pretty close-minded in my opinion. You might become a copy machine. For example, if you have no live model in front of you then your confidence goes out of the window. Purism is very common. Many people look down on the usage of different methods and techniques that are not classical. For example, many might look down on the usage of photo reference, which is a very silly and old mindset to have. Composition skills and imaginative drawing skills are almost non-existent. I should point out though that there are a few ateliers that are exceptions to this, such as the Watts Atelier. As you can see, most of the Cons I have listed are not about the techniques or lack thereof. An atelier is a purely technical place, you go there to learn how to paint, not what to paint or why. It is not really a creative place. Which is not a bad thing, but it is something to be aware of so you are not disappointed. It is up to you to not let your creativity and long term art goals fall behind while studying at a place like an atelier. The kind of drawing process you will learn at an atelier. This one I made using charcoal. Now I will talk a bit about my atelier experience, which was in my case, at the Angel Academy of Art in Florence, Italy. I went there with very basic drawing knowledge and a big fat zero of painting knowledge. Especially traditional painting, I did have a tablet already back then though, so I had done some digital painting before. I stayed there for 3 years and I taught there for 2 of those years as well. To go there was one of the best decisions I have ever made! I learned invaluable skills, grew as a person, met my wonderful girlfriend and made lifelong friendships. I also learned Italian too, which is always a plus! In those 3 years, it wasn't a steady growth though, it was a roller-coaster of ups and downs. The main problem I had was that I got blindsided into improving very technical skills. How to control halftones, mix pigments, the accuracy of shapes, how to use oil paints and medium properly and so on. Then when I sketched on my own in my sketchbook, on Photoshop, tried my own compositions or drew from imagination, it all sucked. Sucked a LOT. The final result I had at the atelier was way more polished and resolved. What I did in my more creative work such as illustrations, compositions, and sketches was always lacking. Then that made me seriously wonder if I really knew how to draw properly. 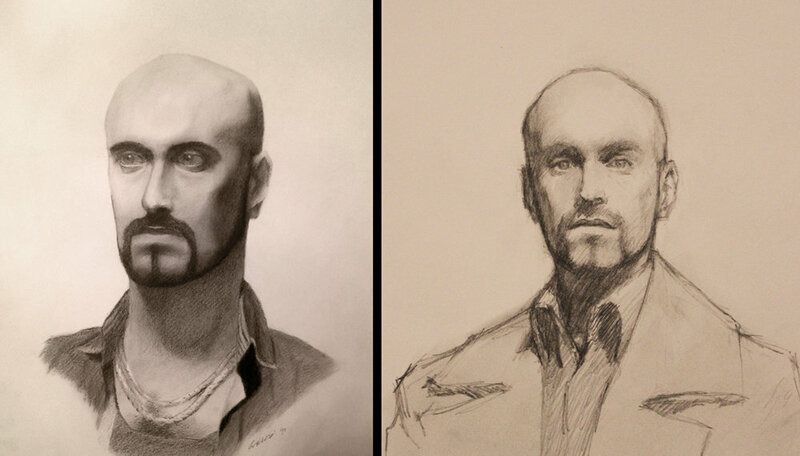 These two drawings I made of my buddy James are around a year apart from each other. The drawing(right) took me 15 to 20 min, while the the other one(left) took me a couple 2 hour sessions of portrait class. Basically my point is that the moment I broke through that struggle was when I took outside input and applied it to my atelier exercises. That's when I did my very best oil paintings and drawings! I used different books and online resources to get a different view on many subjects. For example on how to break down the figure into different proportion systems, how to paint multiple light sources, how to compose an image with intent and etc. My main advice to you is this, don't constrain yourself to what the atelier teaches you. Don’t misunderstand me, I am not saying for you to disregard your great teachers! They are much more knowledgeable than you! All I am saying is that if you want to be able to have full control over what you paint, you have to keep your vision broad, and your mind open. In my opinion, an artist should use whatever tool is available to him/her! If you are in doubt or new to this kind of education, I can provide a list of a few places I have either been to personally or heard very good things from. Do remember that no matter which school, atelier, college, online course you choose to take, you will have to bring a lot of determination along with you! Half of any course is what you bring to the table as a student, if you go somewhere that they don’t teach digital painting, find a way to implement that by yourself. Add extra courses, look at tutorials, ask your peers. If you have been or will be going to any of these, leave your experience in the comments! I would love to know how it went for you.